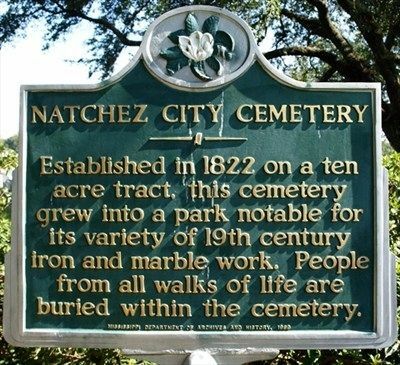 Established in 1822 on a ten acre tract, this cemetery grew into a park notable for its variety of 19th century iron and marble work. People of all walks of life are buried within the cemetery. Erected 1989 by Mississippi Department of Archives and History. Location. 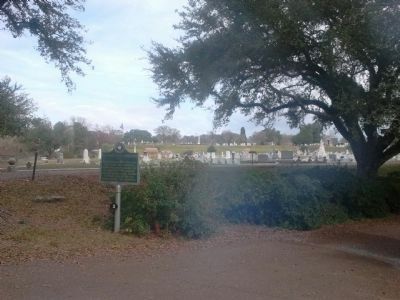 31° 34.488′ N, 91° 23.75′ W. Marker is in Natchez, Mississippi, in Adams County. Touch for map. Marker is in this post office area: Natchez MS 39120, United States of America. Touch for directions. Other nearby markers. At least 8 other markers are within walking distance of this marker. Snakes (approx. 0.8 miles away); Rose Hill Missionary Baptist Church (approx. 0.8 miles away); Wharlest Jackson, Sr. (approx. 0.8 miles away); Intersection of High and North Wall Streets (approx. 0.9 miles away); Natchez Bluffs and River Views (approx. 0.9 miles away); Intersection of High and North Pearl streets (approx. 0.9 miles away); Intersection of North Canal and Jefferson streets (approx. 0.9 miles away); Intersection of Jefferson and North Pearl streets (approx. one mile away). Touch for a list and map of all markers in Natchez. More. 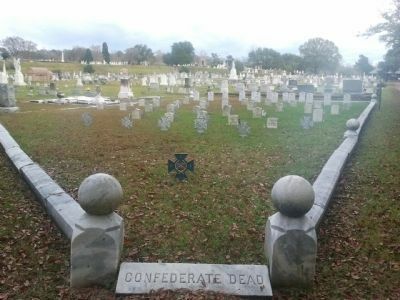 Search the internet for Natchez City Cemetery. Credits. This page was last revised on June 16, 2016. This page originally submitted on December 18, 2011, by Jeff Lovorn of Florence, Mississippi. This page has been viewed 498 times since then and 3 times this year. Photos: 1. submitted on December 18, 2011, by Jeff Lovorn of Florence, Mississippi. 2, 3. submitted on December 17, 2012, by Robert M. Cook, Jr. of Biloxi, Mississippi. • Craig Swain was the editor who published this page.